Are you an adventurous person that likes to camp? Do you have a small group of friends or may be a small family that you like to camp with? Then you can consider buying the 6 person tent as it is a very good option for anyone who likes to camp with some space around. That is correct you can camp with 3 to 6 people in this tent and have little room for everyone to be comfortable, yet snug in cozily altogether. Isn’t that incredible? Now you may be thinking about which one to go for because the brimming with so many branded ones. That is not at all tough to decide because you have us and today we will discuss about something called Sundome 6 Person Tent (green) in details to make it easy for you. Design: It has been designed with state of the art technique that lends it a contemporary look. It is a robust tent with a 6 feet or 72 inches in height at the center. Its dome (as the name suggests, Sundome) like shape makes movement inside the tent quite comfortable and it is available in different colors. The one we are talking about has a soothing green color that can be easily camouflaged in the wilderness. Not to mention, that it keeps you safe and unspotted for privacy. Build: It is made up of polyester that has a weatherproof shield around it to keep you warm and safe inside. Yet, it allows sunlight to pass through with gentility and its floor needs a special mention which is made up of 1000D polyethylene is a hardy accessory that accompanies this tent. You can make the most out of it by putting it up as it should be. With fitting polyester coated zipper, rugged walls, interior mesh, two windows, electrical port (AC), one ground and roof vent makes it an emblematic Coleman Sundome tent. 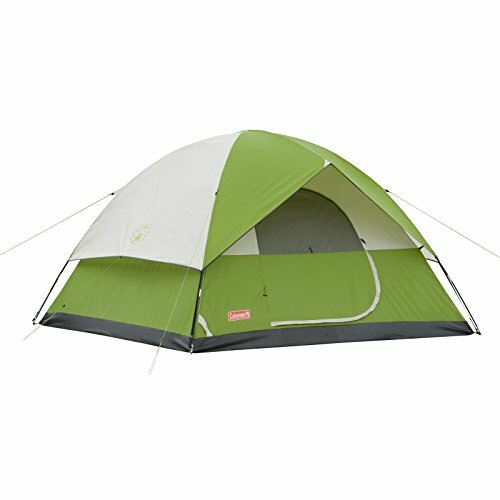 Weight: It is light in weight in comparison to any 6 person tent. Moreover, its fabric, polyester in this case makes it lighter as opposed to conventional cotton tents for sure. It is ideal for short trips or even adventures in the backcountry because of this. Portability: Yes, this is indeed a matter to discuss because you need a tent to move around with. It has to be highly portable and guess what this Sundome tent by Coleman is very convenient to carry. An honest review about the Sundome Tent by Coleman would not be considered without this part and we will point out the problems for sure. However, with products like these even reviewers have hard time as there is really not much to complain about it. Only a few handful people would say that it is good for camping during summer months. We do not know whether they tried during other seasons or not, which makes it a personal choice otherwise. As a matter of fact, it must be stated that buying Sundome 6 Person Tent may not be a big thing. What matters here is the maintenance that you provide for it. It is low on maintenance as already mentioned, but you need to do the least for it like store it properly and keep it clean. This will keep it sanitized as well as ensure to last you long with such care. It is very easy, don’t get worked up and just enjoy your camping trips with this great tent!